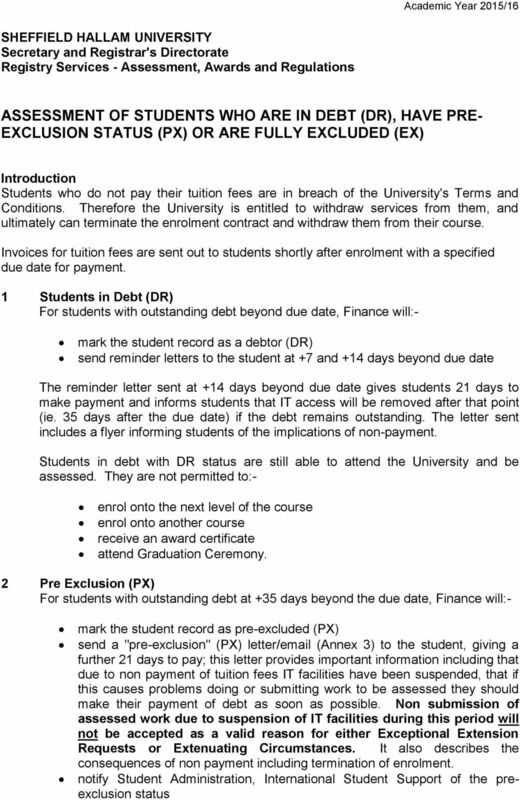 Download "ASSESSMENT OF STUDENTS WHO ARE IN DEBT (DR), HAVE PRE- EXCLUSION STATUS (PX) OR ARE FULLY EXCLUDED (EX)"
2 Academic Year 2015/16 notify Student Administration, International Student Support, once payment has been made in full and arrange for IT facilities to be restored to the student within 24 hours. Students in pre-exclusion status are still able to attend the University and be assessed; unless withdrawal of IT facilities prevents this (e.g. where work is submitted via Blackboard). They are not permitted to:- enrol onto the next level of the course enrol onto another course access IT facilities receive assessment results/transcripts (subject to point 8) receive an award certificate attend Graduation Ceremony Suspension of IT facilities due to pre-exclusion will not be accepted as a valid reason for Exceptional Extension Requests, Extenuating Circumstances or approval of a break in study. Transcripts and results information will be withheld for all students who are in preexclusion status. In some circumstances, students may get to the end of the academic year in a PX status. These students will not be allowed to progress to the next academic year. 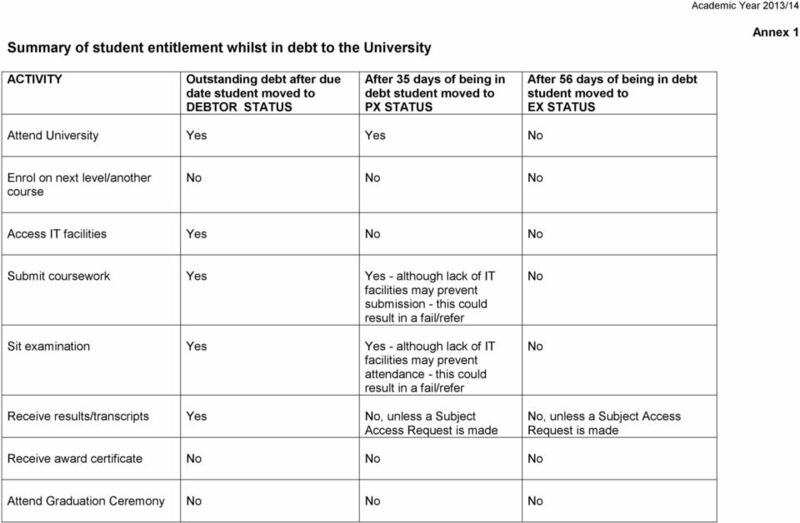 If the debt is not be paid within 2 weeks of the start of the next academic year, students will be considered to have breached the University's Terms and Conditions and will be withdrawn from the course. Payment arrangement Student in pre-exclusion status can, in exceptional circumstances, negotiate a payment schedule in order to clear the outstanding debt. Finance are authorised to agree a payment schedule. Once a payment schedule has been agreed, Finance will update the student status to debtor (RP first to re-instate IT facilities and the following day to DR). Any non-compliance with a special arrangement will result in Finance immediately reverting the students' financial clearance to the pre-exclusion (PX) status. Students will be informed of this action, by and/or letter and will be given a period of 10 days to make full payment or discuss the matter with Finance. This correspondence will also advise the student that after the 10 days if the matter is not resolved, their account will be referred to Registry Services for exclusion. 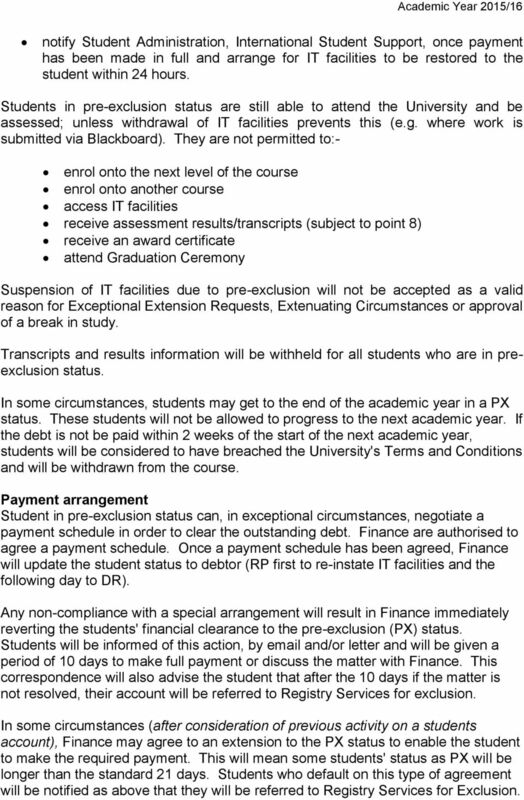 In some circumstances (after consideration of previous activity on a students account), Finance may agree to an extension to the PX status to enable the student to make the required payment. This will mean some students' status as PX will be longer than the standard 21 days. Students who default on this type of agreement will be notified as above that they will be referred to Registry Services for Exclusion. 3 Academic Year 2015/16 3 Full Exclusion (EX) For students with outstanding debt at +56 days beyond the due date, the following actions will take place:- Finance send recommendation to exclude a student to Registry Services. Registry Services (Student Systems and Records) mark the student record as excluded (EX) and issue an exclusion letter/ to the student. 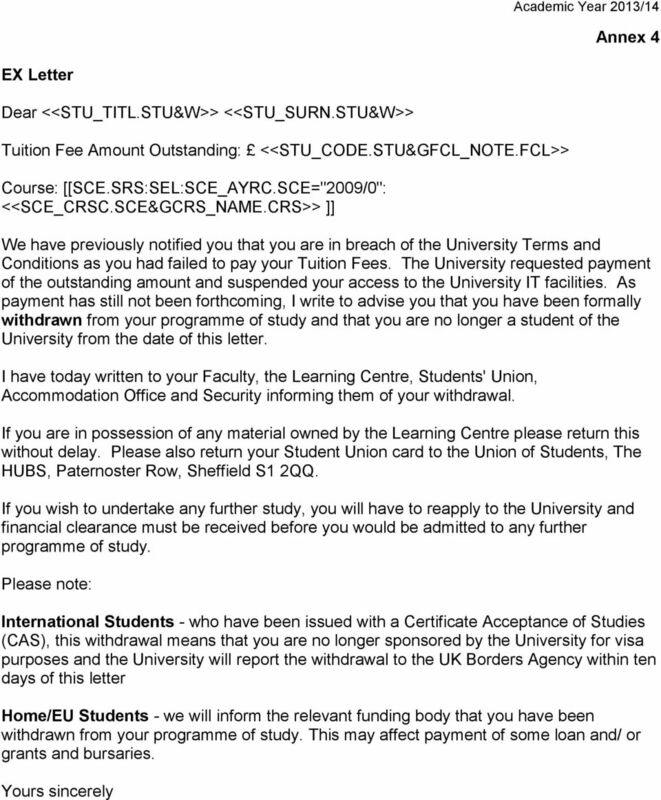 The letter/ confirms that they are withdrawn from their course and their enrolment contract is terminated. Registry Services (Student Administration) close down the student record, processing assessment records appropriately (see Annex 2). 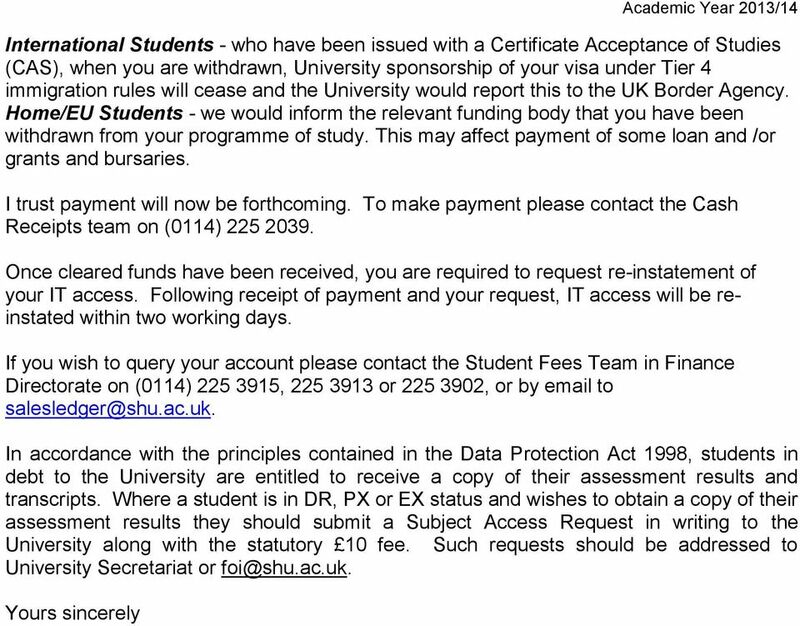 Registry Services (Student Systems and Records) will report any international students who are fully excluded to UKVI. 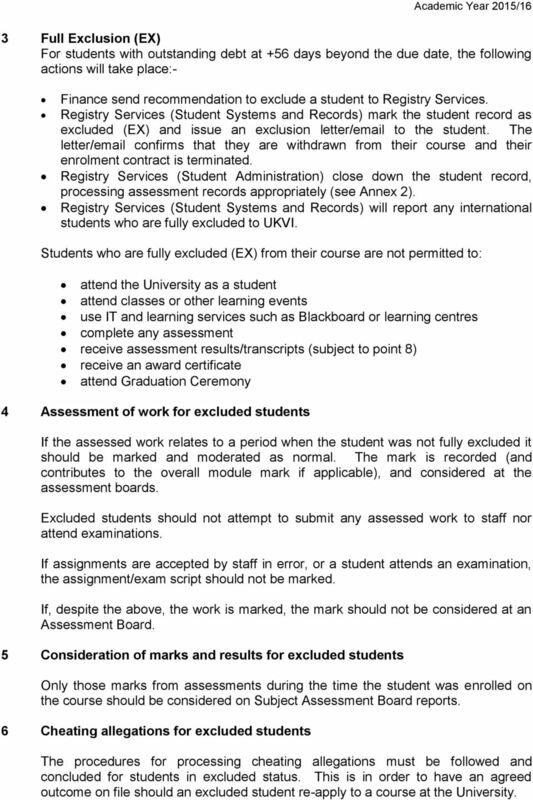 Students who are fully excluded (EX) from their course are not permitted to: attend the University as a student attend classes or other learning events use IT and learning services such as Blackboard or learning centres complete any assessment receive assessment results/transcripts (subject to point 8) receive an award certificate attend Graduation Ceremony 4 Assessment of work for excluded students If the assessed work relates to a period when the student was not fully excluded it should be marked and moderated as normal. The mark is recorded (and contributes to the overall module mark if applicable), and considered at the assessment boards. Excluded students should not attempt to submit any assessed work to staff nor attend examinations. If assignments are accepted by staff in error, or a student attends an examination, the assignment/exam script should not be marked. If, despite the above, the work is marked, the mark should not be considered at an Assessment Board. 5 Consideration of marks and results for excluded students Only those marks from assessments during the time the student was enrolled on the course should be considered on Subject Assessment Board reports. 6 Cheating allegations for excluded students The procedures for processing cheating allegations must be followed and concluded for students in excluded status. This is in order to have an agreed outcome on file should an excluded student re-apply to a course at the University. 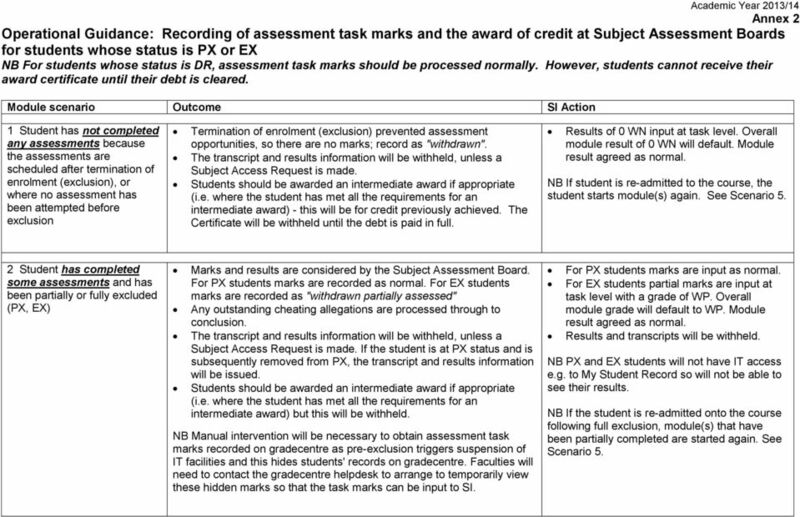 6 Annex 2 Operational Guidance: Recording of assessment task marks and the award of credit at Subject Assessment Boards for students whose status is PX or EX NB For students whose status is DR, assessment task marks should be processed normally. However, students cannot receive their award certificate until their debt is cleared. Module scenario Outcome SI Action 1 Student has not completed any assessments because the assessments are scheduled after termination of enrolment (exclusion), or where no assessment has been attempted before exclusion Termination of enrolment (exclusion) prevented assessment opportunities, so there are no marks; record as "withdrawn". The transcript and results information will be withheld, unless a Subject Access Request is made. Students should be awarded an intermediate award if appropriate (i.e. where the student has met all the requirements for an intermediate award) - this will be for credit previously achieved. The Certificate will be withheld until the debt is paid in full. Results of 0 WN input at task level. Overall module result of 0 WN will default. Module result agreed as normal. NB If student is re-admitted to the course, the student starts module(s) again. See Scenario 5. 2 Student has completed some assessments and has been partially or fully excluded (PX, EX) Marks and results are considered by the Subject Assessment Board. For PX students marks are recorded as normal. For EX students marks are recorded as "withdrawn partially assessed" Any outstanding cheating allegations are processed through to conclusion. The transcript and results information will be withheld, unless a Subject Access Request is made. If the student is at PX status and is subsequently removed from PX, the transcript and results information will be issued. Students should be awarded an intermediate award if appropriate (i.e. where the student has met all the requirements for an intermediate award) but this will be withheld. NB Manual intervention will be necessary to obtain assessment task marks recorded on gradecentre as pre-exclusion triggers suspension of IT facilities and this hides students' records on gradecentre. Faculties will need to contact the gradecentre helpdesk to arrange to temporarily view these hidden marks so that the task marks can be input to SI. For PX students marks are input as normal. For EX students partial marks are input at task level with a grade of WP. Overall module grade will default to WP. Module result agreed as normal. Results and transcripts will be withheld. NB PX and EX students will not have IT access e.g. to My Student Record so will not be able to see their results. NB If the student is re-admitted onto the course following full exclusion, module(s) that have been partially completed are started again. See Scenario 5. 7 Module scenario Outcome SI Action 3 Student has completed or had the opportunity to Marks and results are considered by the Subject Assessment Board. If passed, credit for module(s) is awarded. Completed modules processed as normal and credit awarded as appropriate. complete all possible assessments in module(s) Any outstanding cheating allegations are processed through to conclusion. For PX students marks for outstanding referrals and deferrals are input as normal. prior to PX or EX and has not yet reached the end of the current academic year A PX student can take referred and deferred assessment as normal during the current academic year, although lack of IT facilities may prevent submission which may result in a fail or refer. An EX student is not entitled to take deferred or referred assessment - any such results would be shown as "withdrawn, partially assessed" (this also applies to continued referrals/deferrals). The transcript and results information will be withheld, unless a Subject Access Request is made. If the student is at PX status and is subsequently removed from PX, the transcript and results information will be issued. Students should be awarded an intermediate award if appropriate (i.e. where the student has met all the requirements for an intermediate award), but this will be withheld. NB Manual intervention will be necessary to obtain assessment task marks recorded on gradecentre as pre-exclusion triggers suspension of IT facilities and this hides students records on gradecentre. Faculties will need to contact the gradecentre helpdesk to arrange to temporarily view these hidden marks so that the task marks can be input to SI. For EX students 0 WP is input into any outstanding RAS records for modules with outstanding deferrals/referrals. Overall module grade will default to WP. Module result agreed as normal. Results and transcripts will be withheld. NB PX and EX students will not have IT access e.g. to My Student Record so will not be able to see their results. NB If the student is re-admitted onto the course following full exclusion, module(s) that have been partially completed are started again. See Scenario 5. 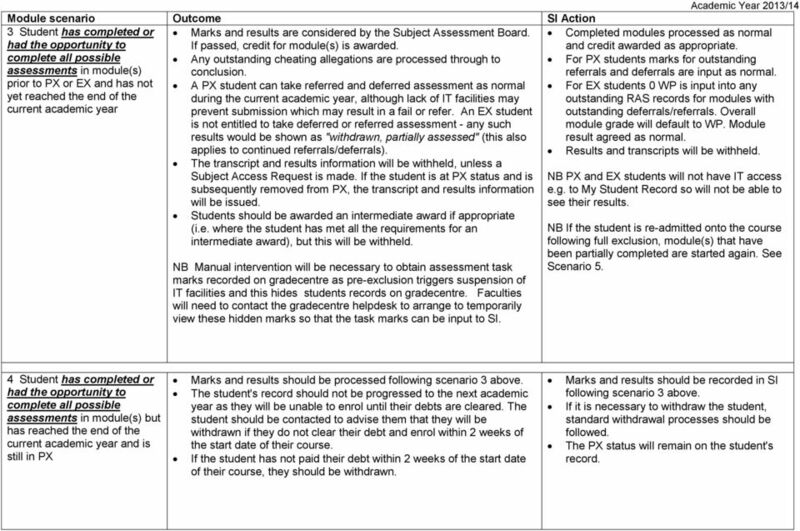 4 Student has completed or had the opportunity to complete all possible assessments in module(s) but has reached the end of the current academic year and is still in PX Marks and results should be processed following scenario 3 above. The student's record should not be progressed to the next academic year as they will be unable to enrol until their debts are cleared. The student should be contacted to advise them that they will be withdrawn if they do not clear their debt and enrol within 2 weeks of the start date of their course. 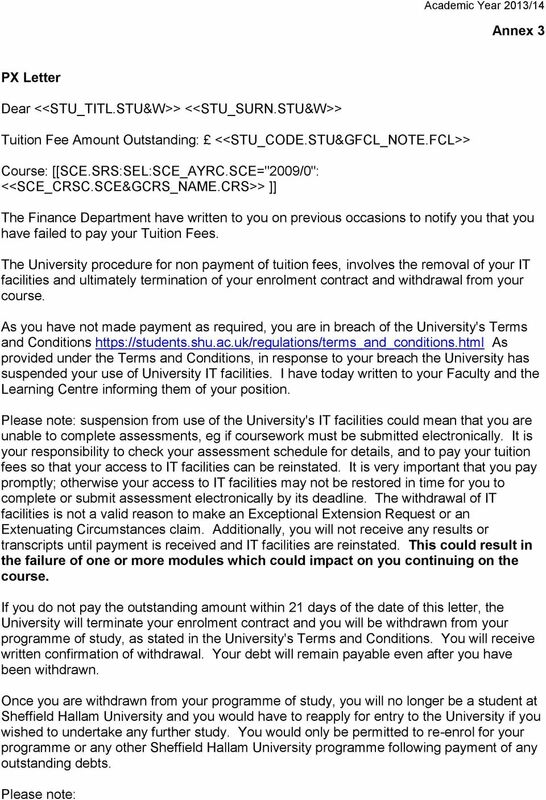 If the student has not paid their debt within 2 weeks of the start date of their course, they should be withdrawn. Marks and results should be recorded in SI following scenario 3 above. If it is necessary to withdraw the student, standard withdrawal processes should be followed. The PX status will remain on the student's record. 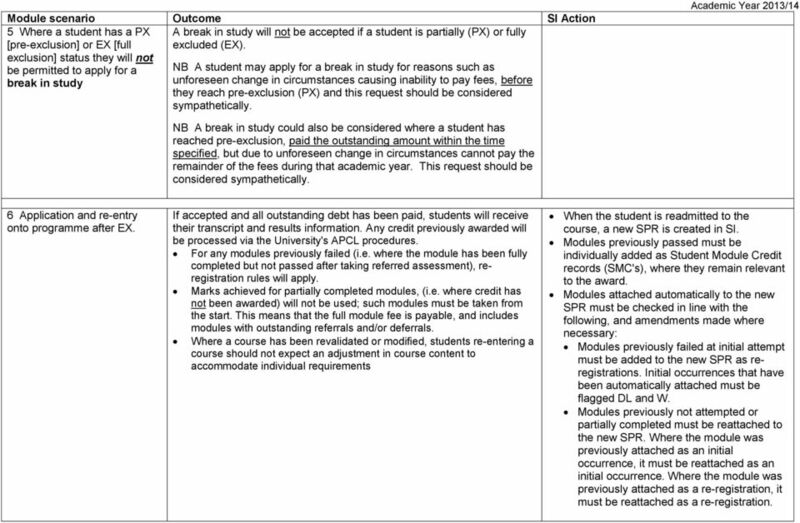 8 Module scenario Outcome SI Action 5 Where a student has a PX [pre-exclusion] or EX [full A break in study will not be accepted if a student is partially (PX) or fully excluded (EX). exclusion] status they will not be permitted to apply for a NB A student may apply for a break in study for reasons such as break in study unforeseen change in circumstances causing inability to pay fees, before they reach pre-exclusion (PX) and this request should be considered sympathetically. Academic Year 2013/14 NB A break in study could also be considered where a student has reached pre-exclusion, paid the outstanding amount within the time specified, but due to unforeseen change in circumstances cannot pay the remainder of the fees during that academic year. This request should be considered sympathetically. 6 Application and re-entry onto programme after EX. If accepted and all outstanding debt has been paid, students will receive their transcript and results information. 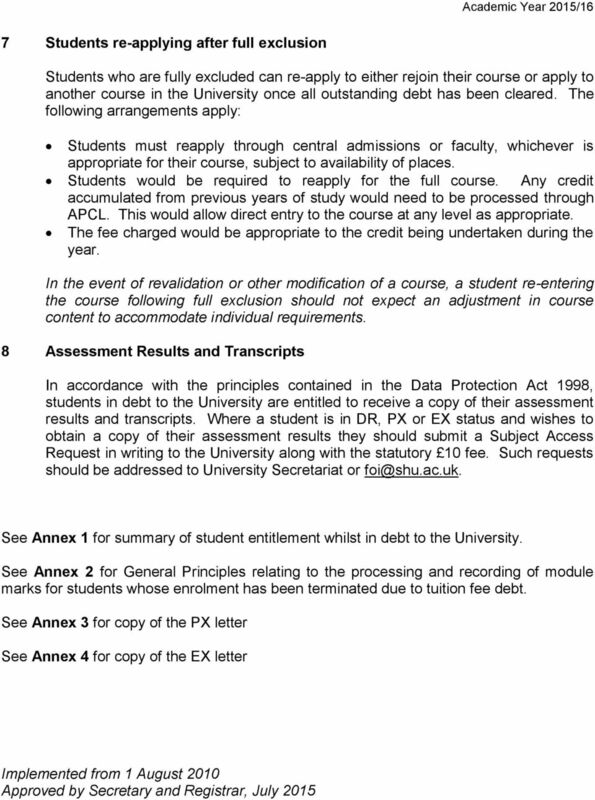 Any credit previously awarded will be processed via the University's APCL procedures. For any modules previously failed (i.e. where the module has been fully completed but not passed after taking referred assessment), reregistration rules will apply. Marks achieved for partially completed modules, (i.e. where credit has not been awarded) will not be used; such modules must be taken from the start. This means that the full module fee is payable, and includes modules with outstanding referrals and/or deferrals. Where a course has been revalidated or modified, students re-entering a course should not expect an adjustment in course content to accommodate individual requirements When the student is readmitted to the course, a new SPR is created in SI. Modules previously passed must be individually added as Student Module Credit records (SMC's), where they remain relevant to the award. Modules attached automatically to the new SPR must be checked in line with the following, and amendments made where necessary: Modules previously failed at initial attempt must be added to the new SPR as reregistrations. Initial occurrences that have been automatically attached must be flagged DL and W. Modules previously not attempted or partially completed must be reattached to the new SPR. Where the module was previously attached as an initial occurrence, it must be reattached as an initial occurrence. Where the module was previously attached as a re-registration, it must be reattached as a re-registration.